1933. The Cunard Line 73,000 Ton Liner No. 534 on the Stocks at Clydebank. In 1838 shipping magnate Samuel Cunard, of Halifax, Nova Scotia, Canada, along with engineer Robert Napier and businessmen James Donaldson, Sir George Burns, and David MacIver formed the British and North American Royal Mail Steam Packet Company (BNARMSPC). Note that this company was distinct from the Royal Mail Steam Packet Company founded in London in 1839 by Scot James Macqueen. BNARMSPC successfully bid for the rights to a transatlantic mail shipping contract between England and America - winning this entitled it to use the RMS (Royal Mail Ship) prefix on its vessels. 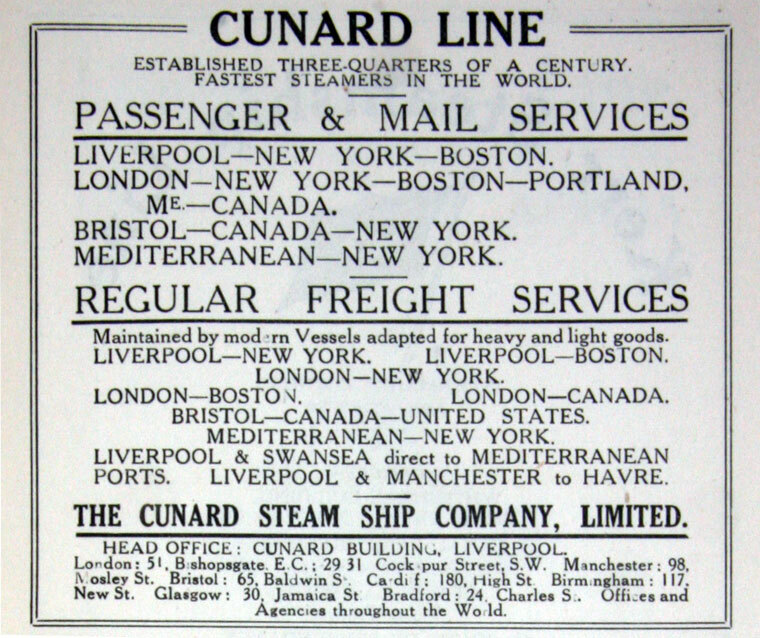 The company later changed its name to Cunard Steamships Ltd. In May 1840 the 648 gross ton coastal paddle steamer SS Unicorn, the company's first steamship, made the company's first transatlantic trip. Under the direction of Captain Douglas, she carried 24 passengers, including Edward Cunard (Samuel's son), on a trip lasting 14 days, at an average speed of 8 knots, thereby meeting the contract requirement of a crossing in a fortnight. Regular passenger and cargo service by steamship was inaugurated by the paddle steamer Britannia, the first ship commissioned by the company. On 4 July 1840 she sailed from Liverpool to Halifax, arriving in 12 days, then to Boston in 2 days 8 hours more. SS Caledonia was another of their early ships. 1845 David MacIver, who superintended the Liverpool branch of the company, died and the reins were passed to his brother, Charles MacIver. 1878 the firm became Cunard Steamship Company, Limited. Cunard faced many competitors from Britain, France, the United States and Germany, but survived them all. This was mainly due to a great focus on safety. 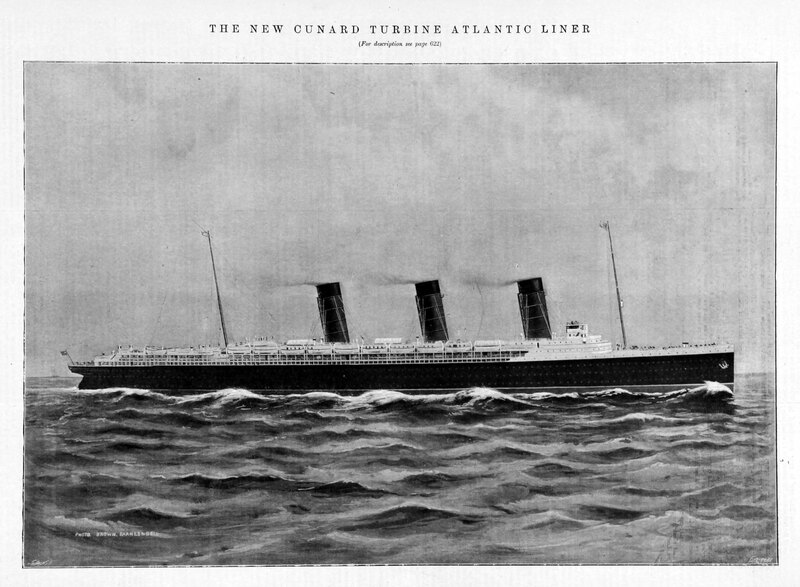 Cunard ships were usually not the largest or the fastest but they earned a reputation for being the most reliable and the safest. 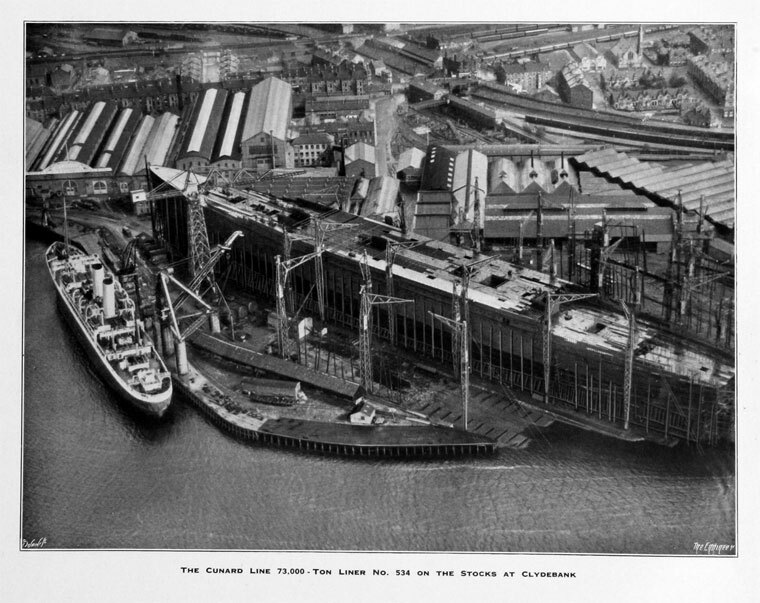 Between 1914 and 1918 Cunard Line built its European headquarters in Liverpool. The grand neo-Classical Cunard Building was to be the third of Liverpool's 'Three Graces'. The headquarters were used by Cunard until the 1960s. The prosperous company eventually absorbed Canadian Northern Steamships Ltd and, in 1934, their principal competitor, the White Star Line, owners of the ill-fated RMS Titanic and the RMS Britannic. The company was then known as Cunard White Star Line. 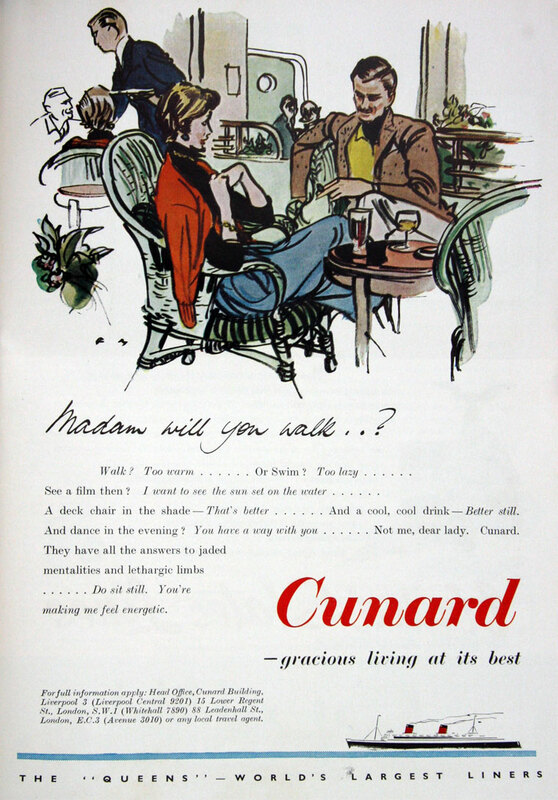 1950 Cunard White Star was renamed Cunard Line. The line began to decline in the 1950s as speedy air travel began to replace ships as the main transporters of passengers and mail across the Atlantic. 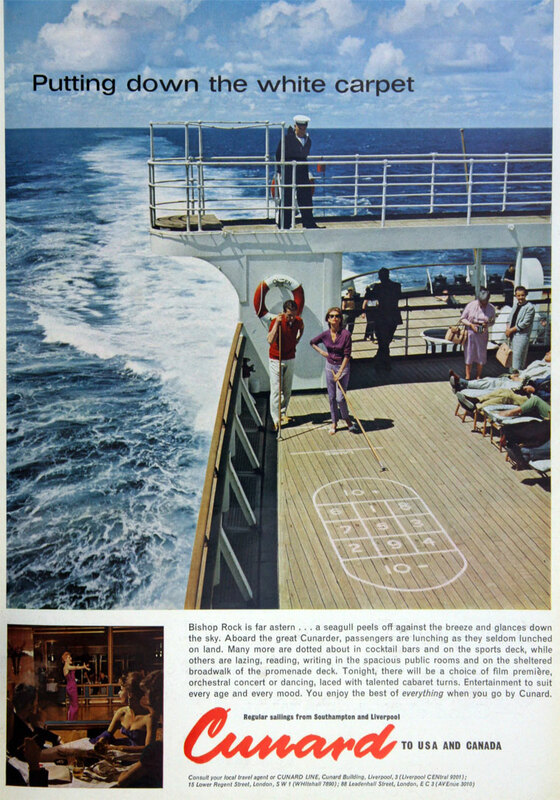 Cunard tried to address this by forming BOAC-Cunard Ltd in 1962 with the British Overseas Airways Corporation to operate scheduled air services to North America, the Caribbean and South America. It was dissolved in 1966. 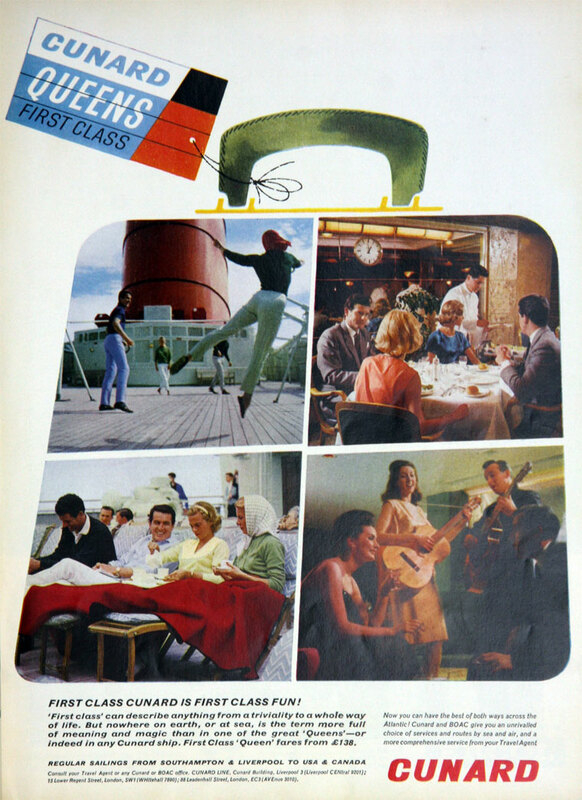 The line changed from providing regular transatlantic services to cruising only, and to entry into the Atlantic Container Lines consortium for cargo services in 1966. Cunard Line and Princess Cruises had headquarters in Santa Clarita. For more than a century and a half, Cunard had dominated the Atlantic passenger trade and was one of the world's most important companies, with the majority of their liners being built at John Brown's Shipyard, Clydebank, Scotland. Its ships played important roles in the development of the world economy, and also participated in all of Britain's major wars from Crimea to the Falklands War, when Cunard's container ship Atlantic Conveyor was sunk by an Exocet missile. Much of the cargo shipping (Cunard-Brocklebank) was merged with Ellerman's remaining shipping interests and sold to Andrew Weir Shipping in 1991. 1994 Took over another luxury cruise company, Royal Viking Line. 1996 Take over by Kvaerner. 1996 Trafalgar House Investments Ltd. was taken over by Kvaerner PLC and the International passenger shipping business operated under the name Cunard. 1998 The Cunard business was sold to Carnival Corporation. This page was last edited on 9 October 2018, at 10:01.